Can you feel it? Fall is here! Days are not quite as warm and our nights are growing cooler. Here in the mid-west, we have even awoken to several mornings of frost on the ground. (and seen a little snow one day!) But fall is upon us, with winter probably pretty close behind. 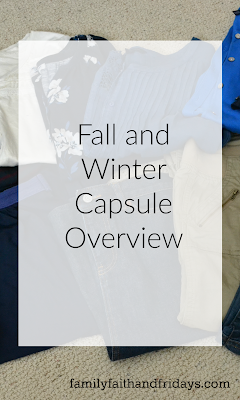 Since I have decided to only do a two season wardrobe capsule that means the spring/summer capsule have found its place in the containers once more and the cooler weather things have come out! Have I mentioned I love cold weather? It is not that I like being cold, but I love layering, I love big comfy sweaters, I love scarves, and love love love snow! So yes, I get excited when I can bring out this capsule! I do keep out a few three quarter length shirts to wear with cardigans when a rare warmer day hits, but other than that, this is a big clothes turnover. Anything that did not work well for spring and summer goes out and then the rest gets packed away until April, give or take. Again, because I tend to operate with blacks, greys, pinks, and purples for the most part, I am usually able to mix and match to the point that my friends do not grow too weary of my clothes (ha). 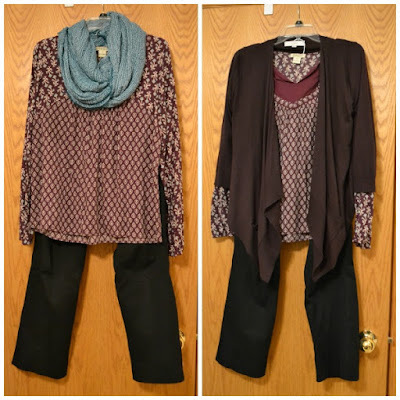 By choosing the next shirt or sweater hanging in my closet and then creating an outfit from there, I rotate pieces pretty evenly so I do not get into the bad habit of wearing the same thing over and over. When wearing sweaters, there are not as many layering options, so I try to be more creative with scarves and jewelry. It helps when you shop carefully and LOVE all that you buy! Yes, we have all been victims of impulse buying, but if we are more deliberate about what we buy we tend to love ALL that is in our closet, not just a few pieces, and wear them all instead of the same two things every chance we get. Last year I became more deliberate about my shopping and when I pulled things out this season, I realized I was much more content, even excited, about the things I had to choose from. By adding a few new pieces this season, I have a wardrobe that I am happy and comfortable with. Whether you have four capsules like my daughter, or just two, I would encourage you be content with what you have, be a good steward of your money, and remember that in the end clothes do not make the man! 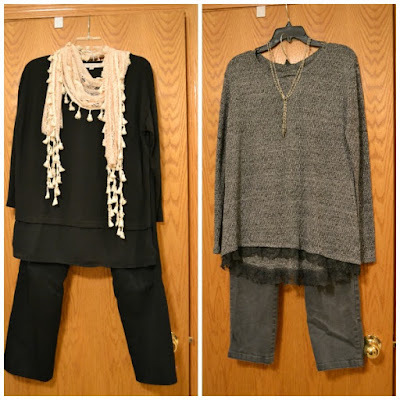 *If you are interested in getting started with a capsule wardrobe, Ashton's post An Unordinary Wardrobe will help get you started. How Then Should I Teach? 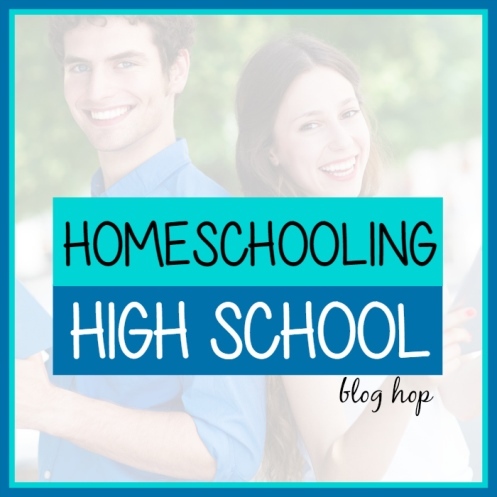 Welcome back to another month of our Homeschooling High School Blog Hop! 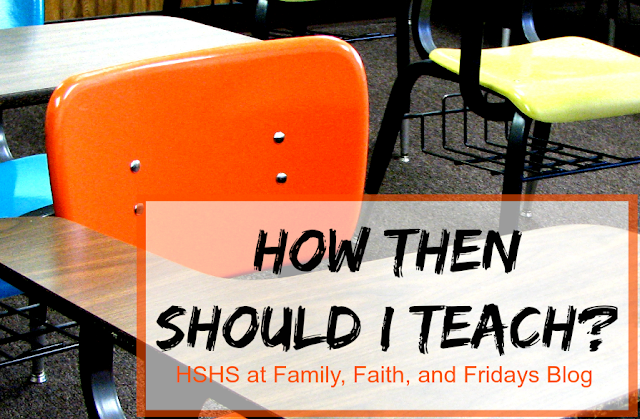 Last month we talked about teaching Language Arts, so up this week is How Am I Going to Teach High School? In thinking about my years of answering questions about our homeschooling experiences, this is the one question I seem to answer the most often. Well, maybe after that whole socialization silliness. It strikes me as funny as well, because quite frankly it is something I really never even thought about. I guess in a way I figured that if God had brought us this far, He had a plan. Good thing, since at the time, I did not. Now, having one college graduate and one senior in high school who already has 23 college credits to her name, I can firmly and with with great confidence tell you that you CAN do this! You can teach high school. You are learning too! For the most part, most of us do not start homeschooling in high school. Because you start at a younger age by far, you are learning right along side your child as you teach them the basics. You learn as they learn and therefore you will have the background you need to teach most subjects. Most subjects are not as hard as you think they are. Yes, Biology and advanced math seemed hard when we were in high school, but that is because we were in high school. Most of us have a few more years on us now and are more than capable of handling more difficult subjects. You do not have to be an expert. Why? Because there are experts out there and most are very willing to help out if asked. Really! Did you know some people really love dissecting frogs? I am not one of them, but I know people who think it is cool and love being asked to do so with a group of young people. You do not have to like everything. Nor does your child. But somethings do have to be taught and learned. Once you make a tentative four year plan for your highschooler, determine those classes that you just do not think you can stomach and figure out a plan B. It may be that you just have to tough it out for a season, but it also may be that an alternative route will present itself. Be willing to think outside the box and even get your teen's opinion on the subject. Their creativity can often help you out here. Keep in mind, that in some cases, life experience can be used for credits if meticulous records have been kept. There are other ways to take a class. Yes, it is your job to see that your child learns, but that does not mean you have to teach them every subject. In fact, sometimes it is a good thing for them to get outside instruction. Both of my girls have taken numerous classes online from a Christian college. Not only have we saved time and money by doing so, but they have been exposed to college level classes taught by some pretty amazing teachers and experts in their particular fields. Peers are sometimes a good thing. Gasp, I know, right? But this is where sometimes a local co-op experience can be a great thing if it is a good co-op. Kids learn from each other, They can challenge each other. And sometimes their discussions can help each other grow. Team that up with a good teacher or moderator, and peers can often be the thing that helps something click in your child's head. I have seen it happen and it is an amazing thing. It is no wonder college professor rely so heavily on class discussions. They know the power of peer learning. The bottom line is that you are capable of teaching your teen! Just as your teen is capable of learning from you. As the saying goes, if God called you to it, He will lead you through it! I have confidence in you! Gena over at I Choose Joy! shares her thoughts on How Will I Teach. . . Homeschool High School Biology? Kym at Homeschool Coffee Break on How Do I Even Teach That? Wendy at Life at Rossmont shares insights on Help! How Do I Teach High School Math?! Good grief! It is no wonder that spelling can be so difficult for some of us. Many of us! Including two of my children in particular. 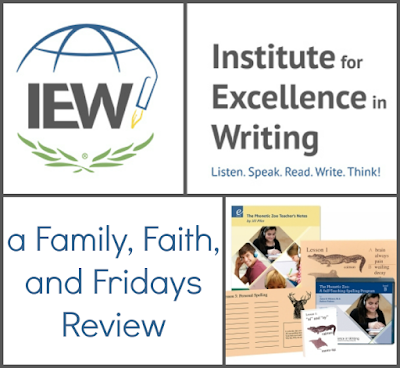 Which is why I jumped at the chance to review Phonetic Zoo Spelling Level B Starter Set by Institute for Excellence in Writing (IEW) when it was offered. By jump, I mean begged. 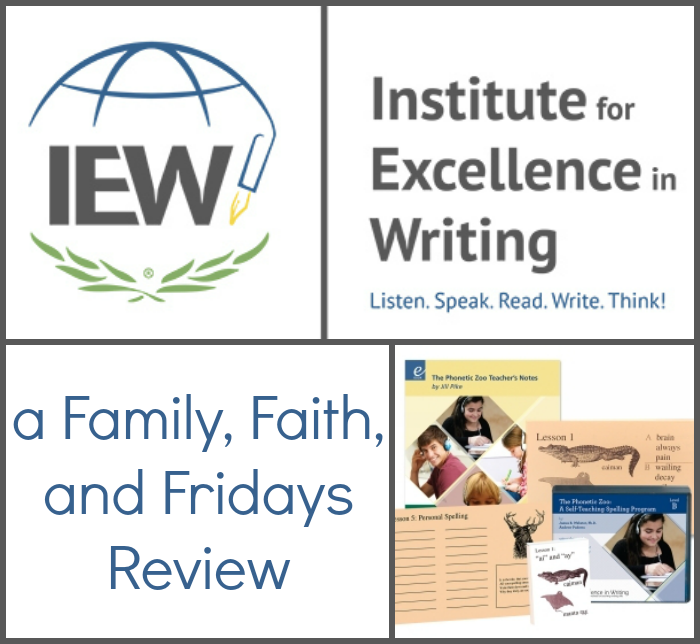 If you are not familiar with IEW, you should jump quickly to their web site and soak it all in, or read our previous Writing Curriculum review to get you started. Phonetic Zoo Teacher's Notes in downloadable PDF form - This 67 page teacher's guide explains the background of the program, shows you step by step how to use the program, and has a page of notes for each of the spelling rules. Each lesson introduces the spelling rule to be taught, the rule, jingle or hint, discussion points you can use with your student, and word lists for all three levels. Mr. Pudewa's Spelling and the Brain video seminar (video streaming link) - I know, I know, we are all busy but you NEED to listen to this seminar. First of all, Mr. Pudewa is funny. He just is and we all need more laughter in our lives. Beyond that, he presents information that just makes since about spelling and our brain and why some of us get it and some do not. I had a lot of ah-ha! moments while listening to this lecture. I highly encourage you to watch it before your child begins the Phonetic Zoo program. You will not be sorry. A-w and a-u the sounds of Y and qu and gu. When your child first begins, they read the rule, review the words, and then take the test. Well, there are a few more details, but it really is that simple. By using the Lesson cards provided, your child sees a spelling rule explained in a cute little jingle as well as an animal that represents it. After reading the rule, they are to read and spell the three words on the front of the card. Now they are ready to take the test! By using head phones, a practice highly recommended by Mr. Pudewa, the child listens to the words dictated and writes the words in their notebook, one by one. They may pause the CD at any time they feel rushed, but on average the lessons take no more than 10 minutes. 15 words will be called. After the child has taken the test they then go to the next track on the CD to correct their own work. If they miss the spelling of a word they cross it off and rewrite it correctly. They then simply repeat the process the following day. Once a student scores 100% two days in a row, they can consider that list mastered and move on to the next list. Every 5th lesson is considered a personal spelling lesson. They are to collect words during the previous 4 lesson periods that they have struggled with in all other areas of their school work to create that list of new words to work on. Appendix 3 has additional words that fit the rules and Appendix 4 contains 240 frequently misspelled words you can use as well. Also contained in the appendixes of the Teacher's Notes are creative ideas for storing and displaying the Zoo Cards. A final exam for each level is included at the end of the program. Be ready! It is a long test and includes words from each spelling rule. Just as stated above really. Well, mostly. Isn't that the glory of homeschooling - you can tailor programs to fit your needs. Like the little Zoo cards. We put those away pretty quickly. I am sure that my girls would have used them and loved them when they were doing spelling, but my 13 year old son, not so much. I get it! I also taught him the lesson only once- the first lesson. He has reached the point of doing much of his school on his own, and spelling is no exception He simply does not need me to read through rules with him. He now keeps the teacher's manual with him and reads the lesson page before he begins a new lesson. While I would not recommend this for younger children it has worked well for us. He does come tell me when he has passed a level to keep me up to speed and I occasionally check on his work to see how he is progressing. As with every other product we have ever used from IEW, we like Phonetic Zoo a lot! Through my 17 years of homeschooling I have used a lot of spelling programs, many with little success and most with great frustration. This son, in particular, is an auditory learner, and so listening to someone (other than mom) call spelling words is a good fit for him. While he does not particularly love the jingles (he's a teen boy! ), they are helping him remember rules and we have seen steady improvement in his spelling. The thing he appreciates the most I think is the fact that this program is not a bunch of fluff and silly exercises. He loves that he is not wasting time doing crossword puzzles and such. He also loves that Mr. Pudewa encourages the students to use pen when writing. Yes, pen! It may seem silly to some, but I think there is just something about using pen that makes older kids feel like a real student, not a little kid. Hey, whatever it takes! Phonetic Zoo comes in three levels. If you already have the starter program and are ready to move on to the next level , you can order just the CD sets. If you are looking for a new way to teach spelling for grades 3 and up, we highly recommend IEW's Phonetic Zoo Spelling! You can take a placement test to see what level you need to start with. I admit that I have a slight obsession with Bibles. There is just something that draws me to them, and so yes, you will find many in our home. All very different. Some belong to specific members of our household, some we have used for a specific years' family devotions, some hard back, some soft, some study Bibles, and some devotional based. And many translations so we can cross reference. Each one I treasure for a one or more reason. And now I am adding one more to our stack as a favorite! 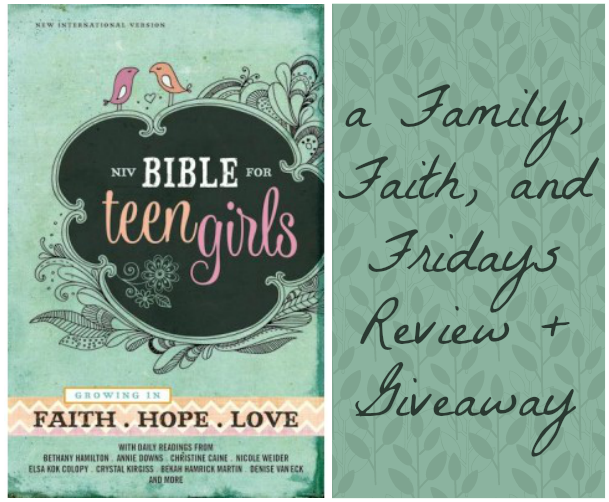 I have recently been able to review The NIV Bible for Teen Girls, published by Zondervan, and been super pleased with it. This 1,615 page, hard bound Bible was designed for girls ages 13-18, encouraging them to grow in Faith, Hope and Love. Daily Readings- These are labeled Growing in Faith , Hope and Love and are mini devotions authored by by women like Bethany Hamilton, Annie Downs and Nicole Weider. Each starts with a scripture to read. They are short and to the point for quick reading, but filled with words of wisdom on subjects relevant to our young women today, such as family, friends and work. Character Profiles- These are, of course, on women of the Bible. Each profile begins with a scripture and then tells what the woman's name means and where in scripture you can find her story, This is followed by a short devotional type paragraph or so about each specific woman. Book Introductions- Each of the 66 books in the Bible are introduced with When Did This Happen?, Who Is In This Book?, Verses You Might Recognize and then What's It About? Highlighted Promises of God- This is one of my favorite features! Throughout the NIV Bible for Teen Girls are highlighted passages in pink that point your teen to God's many promises. I cannot think of a better thing to draw their attention to. How amazing it is that a young girl can flip through a Bible and see page after page of promises made to HER by God! In the back of this Bible you will also find a Topical Index, Women of the Bible Index, Index of Devotions, Table of Weights and Measures, and a very thorough Concordance. As a matter of fact, this is one of the largest concordances I have seen in a Bible specifically marketed towards young people. Yes, I believe that the word of God is more than enough for us to point our teens towards Him. But I also have two girls, one of whom is still a teen, and I know the struggles they have faced in those teens years. It is nice that they can have a place to go that not only points them to truth, but shows them how that truth is still relevant in their lives today. It is nice that teens can hear from others that have walked the same paths, and shared the same struggles, and have a beautiful testimony to share. In this world of hurt and confusion, I do not think we can ever run out of encouragement for our girls. The NIV Bible for Teen Girls will provide just that encouragement. May they know God and His love more every day. FlyBy Promotions is graciously gifting one of our readers with a copy of The NIV Bible for Teen Girls. Just leave me a comment and tell me about a special young girl in your life you would like to gift this Bible to and a random winner will be chosen next Friday. Please make sure there is a way I can reach you if you win! We love Spanish here. And we have used a lot of Spanish programs to help us learn. But The Fun Spanish by Brookdale House is now at the top of our list for fun ways to learn Spanish. Seriously, fun! The Fun Spanish is a Spanish program for elementary ages that is, you guessed it, fun and simple to use. 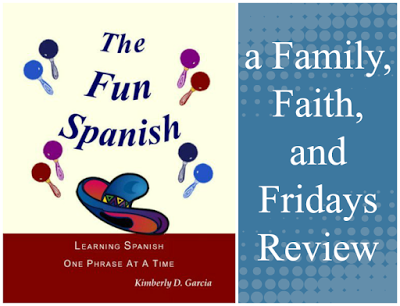 Whether printed book or the e-book form we reviewed, this Charlotte Mason style Spanish program teaches the conjugation of 11 verbs in addition to numerous nouns, prepositions, and adjectives. By combining those words, The Fun Spanish teaches kids how to create and speak simple Spanish sentences, one sentence at a time. How? By being silly! Isn't that what fun is all about? At the beginning of each weeks lesson your child is introduced to a new verb and shown how to conjugate it. They are then given 6-10 new words each day to learn as well. Next they practice using those words by writing a simple sentence given in Spanish. Then the fun begins. The next sentence given is in Spanish and your child has to read it and use his words for the day to decide what it says. The fun part? The sentences are silly. Really silly! I am a big, green cat with long legs. He is an orange rat with 8 hairs. This is a pink fish with 9 black wings. We are yellow monkeys. We eat pasta. Finally your child has a space to draw a picture of the sentence. The following four days after, the child writes the same verb and its' conjugations, but adds a few new vocabulary words. There is another sentence to write each day and another sentence to translate and illustrate, each one equally as silly. On day five, there is a review page. On that day you review each of the four silly sentences, translating them in your book. You also conjugate the verb with no help, and review the weeks' vocabulary, By doing one lesson, which is comprised of 5 days, every two weeks, The Fun Spanish is year long program. You can use the second week to review the words learned. We have been using The Fun Spanish with my 8 year old for about 6 weeks now. I originally printed out the first three weeks and keep them loose leafed, but quickly realized they were getting so much use it was better to print it all out at once and bind it. So yes, I printed out all 203 pages and put my binder to work. Because Colby has a pretty solid foundation with Spanish vocabulary we have done one lesson a week with good success. Each day he conjugates the verb, his least favorite part, translates the sentence, his favorite part, and draws the picture. Sometimes he has me draw with him, but regardless we always end up giggling. One, it is fun and engaging. There is little stress and it flows easily. Secondly, I love that while it teaches vocabulary, the primary focus is on sentence structure. Most programs we have used in the past teach a lot of vocabulary and nothing else. While vocabulary is important, I know from experience that knowing all the vocabulary in the world is not helpful if you cannot speak a sentence. Don't worry if you cannot do this on our own, the answers and translations are provided at the end of each lessons. Because Colby is so excited to see what the next silly sentence was going to be, he quickly reads the sentences in Spanish with no hesitation and little thought. After just a few weeks in a row, he became more and more comfortable and I noticed his speech became more clear and smooth. Let's face it, the more you practice, the better you become at something and the more comfortable you become. Silly sentences are not threatening to a child, they are just fun! 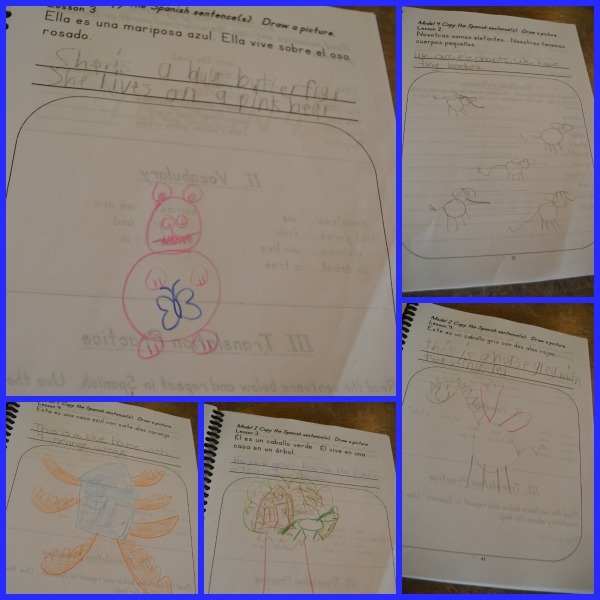 In addition, I noticed that his reading comprehension became better by about week three. He had to look back at the vocabulary lists less and less which was so encouraging. Now The Fun Spanish is one of the first things he wants to do in the morning. While it may not make him bilingual in a year (what program will? ), I have no doubt that it will teach him a lot and make him more comfortable with the Spanish language. All in all, a great goal for elementary age curriculum! It is always a pleasure to review family friendly movies, but add in one that is one created by Phil Vischer, creator of Veggie Tales, and well, you got me! Galaxy Buck: Mission to Sector 9, a fun twist of a tale mimicking Star Wars and Star Trek, that tells of one Buck Denver and his outer space adventures. Buck has one goal in life: to do big things for God. In fact, he has a poster in his workplace that says just that- "God wants you to do big things!" 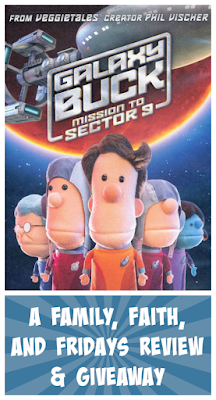 Buck and his workplace friends set out on a mission to take God's word to a remote place in space, Sector 9, that has lost it's transponder- the way they are able to hear the preaching of a famous pastor. Buck thinks this will be his way to do something big and make a difference. Through a series of crazy adventures, what Buck learns in the end is that only half of his poster is true- God wants YOU! Period. Just you! Buck learns that having a dream is important, but more important are God's dreams. We must learn to follow God's will, not ours. Pretty profound, don't you think? Cute, cute, cute! I admit to not knowing what to expect with this movie. When it begins, it is clearly puppetry combined with animation so I was not sure all the kids in the family would be impressed. But, let me just say, the giggles started immediately. And not just from the 8 year old! Our whole family laughed a lot and is STILL quoting lines. Yes. We are weird like that. Like when Buck introduces himself as Buck, Buck Denver. And then the other character calls him Buck Buck the rest of the movie. He does try to correct him, but the guy tells him he likes Buck Buck better. Movies are always better with pizza, right? Above all though, are the Biblical truths that Phil Vischer is famous for embedding in his films. Through fun and laughter he conveys Gods's love for us, His plan for us, and how we must trust in Him! 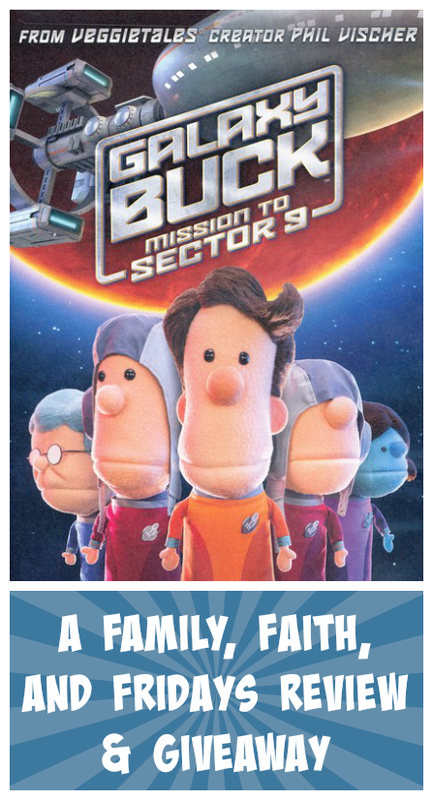 When you watch his movies, Galaxy Buck: Mission to Sector 9, you come away with a positive, Biblical message, Biblical truths, and clean family fun, appropriate for all ages. Good news- Fly By Productions is providing me a copy of this newly released, 40 minute DVD to give to one of our readers. Leave me a comment and tell me your favorite Veggie Tales movie and you will be entered! A random winner will be drawn next Tuesday! Morning Meeting. Circle Time. It has several different names, but usually the same goal. Start your school day with your child, reviewing a calendar, basic math facts, Bible or other memory versus and such. 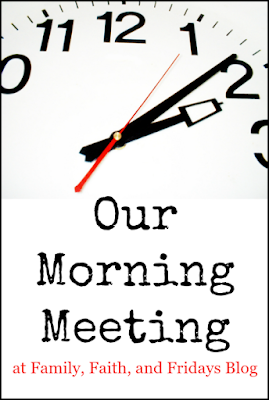 I created a Morning Meeting Folder. On the outside I stapled the sheets we would use daily for the month. In the inside left pocket I have two sheets that are updated monthly, and on the right hand side I store copies for the next month. I am sorry to say that the site I printed most of these pages out from did not put their name on them anywhere and for the life of me I cannot remember where they came from. If they are yours, please let me know so I can give you credit and link to your resources. They are indeed wonderful! Ignore the word Spoopy! It is a family joke. The first sheet we do is the calendar. Colby fills in the month and year each month and then adds the date on the calendar. This is also a great place to practice patterns for younger children, coloring each day in a particular color pattern for the month. Our next page requires Colby to actually write the day of the week and the date several different ways. The next page we use is a basic hundreds number cart to practice writing larger numbers. This is the first year we will celebrate the 100th day by doing something exciting. Yes, I am a little behind the Pinterest fun curve. Don't tell my kids! The next page is a simple weather chart. Can I just tell you that I cannot wait to see a snow day added! The last daily page is a simple math fact page based on the number for the day. You do things like identify whether it is an odd or even number, add 1, 10 and 100 to it, write it in expanded form as well as in words, show it in tally marks and write a number sentence with it. There is also a clock to fill in and a place to count coins. In addition, we work on memory verses and character traits as a family, so this is a time that we review both of those things. All in all, if all goes well, it takes us about 15-20 minutes to complete this portion of our day. It allows for some good review time and a little fun along the way. It also establishes a strong routine for my son, something we have found quite beneficial for a successful day. The two sheets on the inside left cover are completed once a month. The first is a signature page that we will fill in once a month for a record of how his handwriting improves over the course of the year. I think this would be a great addition to a child's scrapbook if you do that sort of thing, The second page is a monthly weather chart that allows your child to take the daily information gathered for the month and put it into a more condensed monthly graphic. I like the idea of this as it it is a skill found on many state tests! 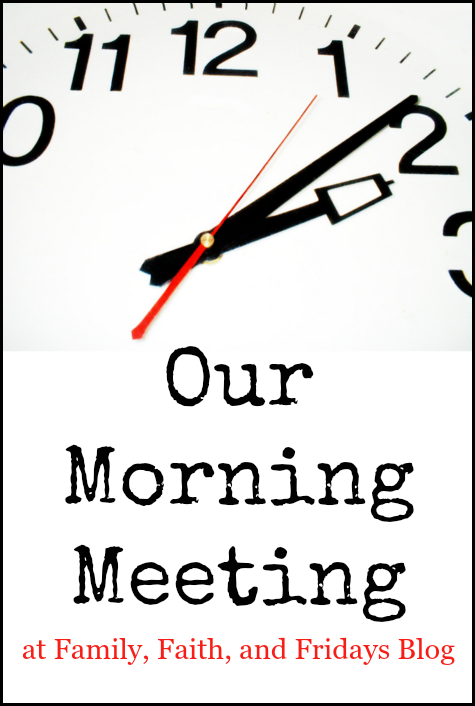 If you have littles you can adjust the morning meeting to better fit their age. We have used this time in the past to also sing songs and do finger puppet plays and poem memory work. Lap time is so important, so use this time to snuggle! Our morning meeting is a time of learning and review, but more importantly a time of fun and bonding. It is a time to explore together, pray together and start our day off on the right foot with a smile on our faces. From there, well, we will see. It is always a privilege to do a review for a friend. It is especially fun when the product is one you end up loving! Let me tell you first of all that I LOVE candles. Like, really love them. There was a time in my life that I would have four or five burning all over the house. There is just something about a room with a gentle fragrance that fills the air that just says welcome to me. But then came the allergies. They may have always been there, but the more I burned candles the more my kiddos seemed to have allergy problems. And then was the little issue of my slight obsession with candles and the amount of money that was going into that obsession. Long story short, we walked away from candles. I know, can you believe it? No more candles. That was about 5 years ago, and with few (and I mean few) exceptions, we have not burned candles. Well after burning two of these candles, I know why Simply Pure Soy Candles excited everyone! Your candle will come from only the best soy blend and the strongest however gentlest fragrances possible. I love making soy candles, I love the memories I smell in the scent that is burning and the smile that they can bring to someone that is down. Hand poured in the heart of the North Carolina mountains, these candles are made from soy beans grown in the United States. They burn cleaner and 30-40 times longer than paraffin wax, are non-toxic and contain no animal fats. Many are perfumed with essential oils which is a plus in my opinion! They are also water soluble and therefore clean up with warm soapy water in case of a spill. And the scent? Lovely! One of the first thing my girls said was how they loved that when you enter the room you could smell the fragrance, but you were not bowled over by too powerful of a smell. So true! Because we are a everything-fall-loving family, we have really enjoyed the Brown Sugar and Fig, but the Cool Citrus Basil is equally as delightful. And the best part, so far none of my allergy sufferers have experienced any adverse affects. They are content and I am thrilled to have a few candles back in the house! You can't beat that combo! I would encourage you to check out Kayla's Simply Pure Soy Candles Etsy site and take a look at all the wonderful choices she has for you! With names like Peppermint Bark, Red Hot Cinnamon and Apple Butter, you are sure to find a candle you will love and at a great price! Tell her I sent you! A few candle safety reminders- Always keep candles away from children and pets! Do not keep a lit candle in a draft! Keep wicks trimmed to 1/8 inch and never burn a candle more than 3-4 hours at one time. Candles made with soy waxes need to be kept away from sunlight to prevent fading. Glass jar containers need to be handled with care, they will be very hot! Never burn a jar candle that is cracked or chipped. 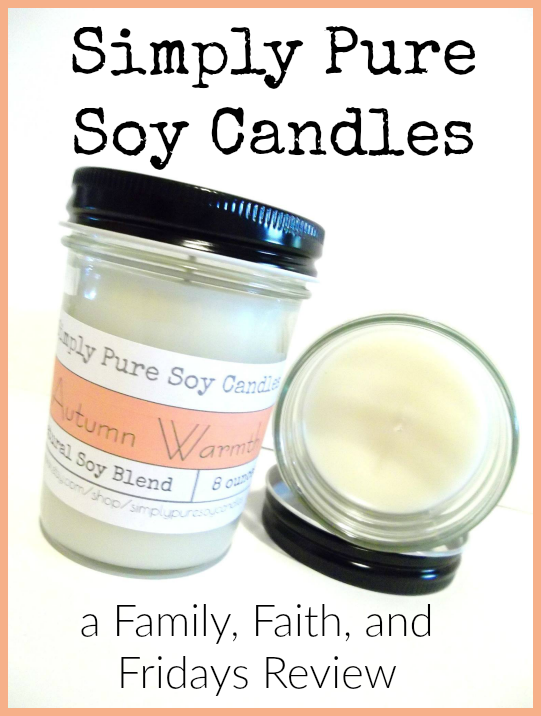 You can also find Simply Pure Soy Candles on Facebook! 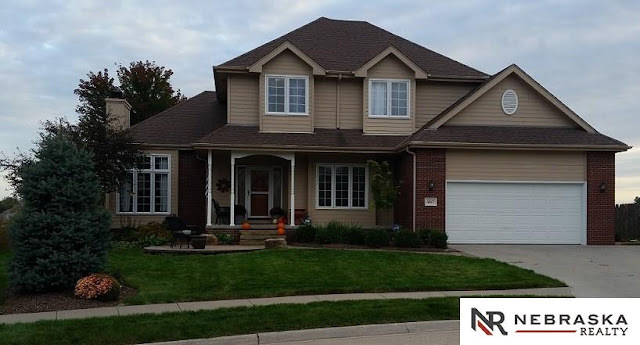 Why yes, I did just buy a house! Can I tell you, our excitement is not so much about the house, though that is exciting, but the fact that it is just one step closer to having my family back together under one roof. My husband got news of his deployment mid-September of last year, started training every other week in October, and left in November, returning home for just a few quick days before heading out in December. Yeah - so much for 365. I stopped counting how many days he has REALLY been gone, it is just too hard. But before this year is up, this past year will hopefully be a distant memory and we will be settling in as a family of 6 again. In a new house and new town. It is funny, I went house hunting with four kids (that is not the funny part, trust me) and certain expectations. The kid part went exceptionally well. The expectation part, not so much. Three or four houses turned out not to be houses- just land in a not-yet-developed neighborhood. Like roads not even made. How is that a house!? That is sneaky advertising if you ask me. Three houses were right in the middle of construction and since we may only be there two years, I just couldn't stomach waking up to hammers for most of that time, despite the lovely brand new sparkling homes with the floor plans I loved. One house we saw was amazing but just not in the right location and another was a really great location but needed more work than I was willing to commit my poor husband to. One house was great and in a great location, but pretty high over what we wanted to spend. See how well this was going? That was all on day one. That night I had two choices- one that needed a lot of work and one that could break the bank. My expectations went in the trash and I went to bed praying that God would show up big the next day. See where this is going? Oh, and did I mention it is currently owned by a homeschooling family with a dedicated school area complete with built in desk for two and storage cabinets? We put in an offer and we close in November. Yes, God showed up big! Did you know that if you eat three meals at home, 7 days a week, you are eating 21 meals a week at home? If you are the mom fixing said meals, you are cooking 21 meals a week. Now, that may not be reality for everyone's family, but it is pretty close for me. Because we homeschool, my kids eat lunch - you guessed it, at home. And because we do not eat out often for multiple reasons we hit pretty close to that number. Let's just say we average about 19 meals at home a week. Yes, the older girls occasionally cook, and yes, my boys can make their own sandwiches, but because of the makeup of our home, I am the primary cook in our house. Again, three meals a day, 7 days a week. It does get old occasionally. And in this season of our life I have grown a tad weary. I knew I needed a plan and sending the kids to public school just so someone else could fix their lunch was not really an option. Not that it wasn't tempting. Dinnertime for us equals family time, so breakfasts became my targeted change. Here is how it has played out and how I am now surviving breakfast. I wrote down menu choices that my kids like. For three days of the week they have a choice between two similar items and two days are cereal days. I will get to weekends in a minute, promise. The method behind the madness was this- if I let my boys, ages 13 and 8, choose everyday on their own what to eat, they would choose cereal. I do not like cereal. Well, actually, I do like cereal, but I cannot stand how expensive it is, how fast my kids can go through one box, or the fact that it is not very nutritional. Hence the 2 day limit! Next, I put the choices on a chart with boxes for each boy and laminated the chart. (You KNOW how much I love charts!) 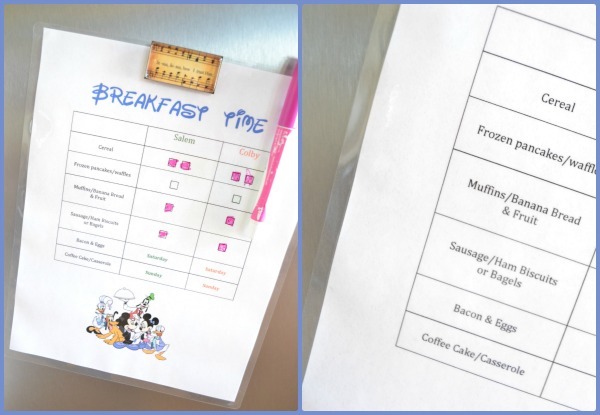 It hangs on the refrigerator where each morning they choose from the list in any order they want, and check off what they had. Each of the choices is pre-made by me and in the freezer for them. All they have to do is pull it out of a bag in the freezer, pop it in the microwave for a minute, and eat. They work as a team, have a good breakfast together, and are learning a little independence, while I have an extra hour by myself in the morning for work. Instead of cooking each morning, I batch cook and freeze while I am already cooking on Saturday morning. I originally thought I would do so every Saturday, but what I have found is that because they have a choice between two similar things, there is plenty in the freezer to last two weeks! Yay me! Cooking time so far has only been about an hour each time. I felt slightly guilty (for about a day) concerning the fact that I was not eating with them, but since I eat every lunch and dinner with them I got over myself quickly. 16 meals together is surely better than none! Saturday and Sunday meals are prepared by me and are pretty standard - eggs and bacon on Saturdays (which dad will take back over when he returns) and Sundays are usually a breakfast casserole or coffee cake. So what do their menu choices look like? No, I did not mention my girls. Because of their ages and their crazy schedules, plus allergies added in, they have been on their own for breakfast for a while now. I promise I am not starving them. It is that easy! Promise. There was no rocket science involved- just a tired mamma trying to find a better solution! No one has starved, there have been no kitchen disasters to date, and I am surviving breakfast! And getting some work done too! A win-win, wouldn't you say? More than several years ago my older kids had the opportunity to take an archery class with my husband. They had a blast at the time, but have not had much opportunity to shoot since then. In the past few months however, our homeschool co op has begun an archery class that the boys have been able to fit into their schedule. Salem has enjoyed it so much we have invested in a good bow for him and we are looking at archery clubs in Omaha for him to hook up with once we move. Who knew that archery was such a popular sport AND good exercise as well? Even more fun is that it something that both boys can practice together! 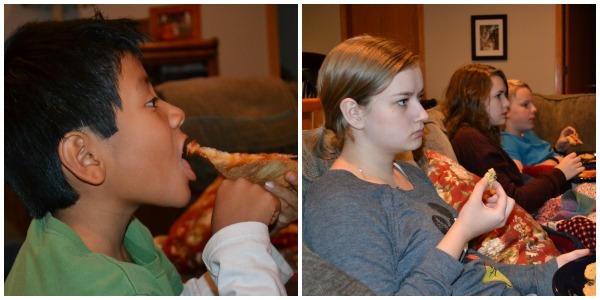 With the 5 1/2 year difference in age, finding something they can enjoy together is often a challenge. I love being able to see Colby learn from his big brother! It is our hope that the girls will find time to join us soon, and we can pursue this fun sport as a family. What about your family? Do you have a hobby that you share together?